The CAME automatic swing gate system is a strong, powerful and electromechanical. These quality guarantee the long term reliability of an automatic gate system. 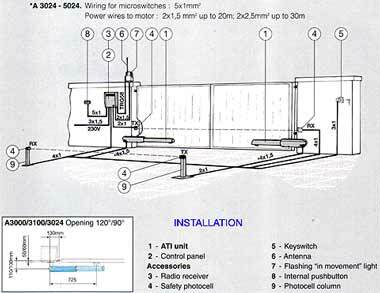 ATI is also easy to install and does not require any structural gate modification. * Electromechanical gear motor: as all CAME automatic systems ATI does not need periodic maintenance. *Strong and compact: die-cast all aluminum structure. *Powerful: designed to operate in especially heavy-duty cycles. 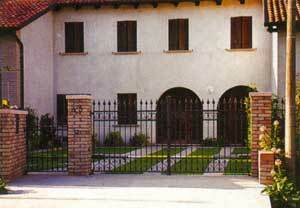 *Self-locking: maximum security by keeping gate closed. *Key release mechanism: lock is interchangeable and compatible with other CAME appliances. *Possibility to release the motor from outside by means of a handle and cable. Speed adjustment and deceleration adjustment in opening and closure; intensive use, possibility of battery back-up, obstacle detection: all these are characteristics by a DC 24V automatic system.